In the main menu select Exit or press Button, after pressing it will exit to XMB. To show the menu select Show help in the main menu, will show data about all menu options. To show the credits press in this screen, and to go back press button. When you are done you can go back to main menu pressing . ErikPshat, sonicswink, jolek and 5 others like this. I cleaned up some of myself and trances off topic conversation as well .. 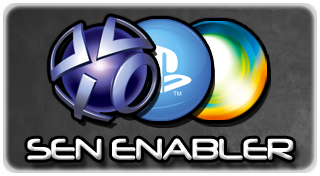 I'm curious what the differences/similarities are between SEN Enabler and PSN Patch. Should a person use one or the other, or both at the same time or...? Thanks for all your hard work. [MENTION=76]Evilnat[/MENTION], where link download for v5.7.0 ?, thx. yes, any file host please. I have dl'ed new sen and was able to spoof to 4.66 but when i try to patch my id with r3 with my old .txt file it says " patch files not found". did the format of the .txt file change? I am using the same file i have been using from the usb in the 1st usb slot from the left side. I was on sen enabler from 2 versions ago. by default your app is set to look for the .txt file from HDD. I found in the setting where I can change it to usb and all is so far good now. Thanks for you works and your replies. yes all is good and im back online! !